The @PhoenixSuns announced via Twitter on Wednesday that Kayte Christensen (@SunsKayte) has been named their new #socialsideline reporter, the first position of its kind in the NBA. The former @PhoenixMercury forward returns to the Valley to join the Suns’ home-game broadcasts on @FoxSportsAZ and @AZSports620 this season, to share comments from fan discussions taking place on Twitter, Facebook and Google+. Additionally, she will also bring social media elements to the live game-night experience at @USAirwaysCenter. In between packing boxes in New York, Christensen took a timeout to talk with Suns VP of Digital, Jeramie McPeek (@jmcpeek), about returning to the Valley and her new role with the organization. Suns.com: How are you feeling about moving back to Phoenix and joining the Suns’ broadcast and social media teams? Kayte Christensen: It’s extremely exciting, obviously, having played there for so long. I made great friends while I was there and the organization has such a fond spot in my heart. And I’m really excited to come back to work for the Suns. They have been my favorite NBA team for as long as I can remember and to have the opportunity to work for them is just amazing. 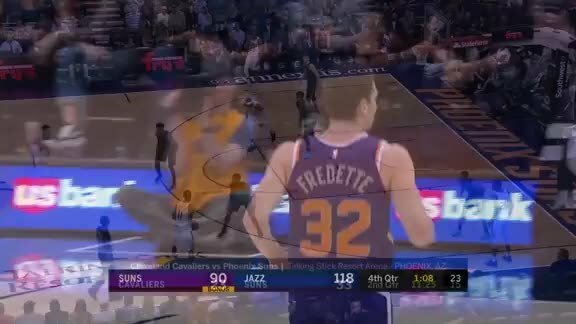 Suns.com: Talk about your position as the first social media sideline reporter in the NBA. Christensen: It’s where broadcasting is going. There is such a social media drive now, as fans have an opportunity to be involved with their teams during games and talk to each other. So integrating that conversation with the broadcast involves fans on an even bigger scale. So to have the opportunity to be a part of that in its infancy is really exciting. Suns.com:What do you hope to bring to the broadcasts and in-arena experience? Christensen: I just want to give fans that outlet, to make them feel like they’re involved and can voice their opinions or ask questions. And , of course, basketball has been my life for as long as I can remember, so to stay in broadcasting and to see what is made out of this position, I’m just really excited to see how it grows. Suns.com: What do you enjoy about social media? Christensen: Well, I started using social media when I was broadcasting in Sacramento, and I was a little leery of it in the beginning. But once I got involved in it, I got hooked very quickly, because you really are able to talk to people and answer questions and hear their thoughts, but also express your own opinions, and I think that that’s just an amazing thing. Suns.com: What are your thoughts on how fans can now interact directly with athletes via social? Christensen: Yeah, I think that it’s such a great thing for fans. You know, fans have this perception of players on the floor, but when athletes are able to be themselves and voice things in a social media setting, it really allows fans to get even more invested, because they feel like they know them more. To see Steve Nash tweeting about playing in a soccer game or about his green energy initiatives, allows fans to see another side of him and get to know him better, which I think is an amazing thing. Suns.com: Can you talk about your time with the Phoenix Mercury? Christensen: I truly feel like the Phoenix Mercury have the best fan base in the WNBA. They embraced me in such a way that was an amazing experience for me. It’s funny, you go from college into the professional ranks and you realize how few spots there are, and I figured out very early that I had to be a niche player in the WNBA. Everyone thinks they can be the leading scorer and pays attention to stats. But I realized early on that what the coaching staff and the fans really appreciated from me was how hard I worked and what I was willing to do, the little things that that you don’t see on the stat sheet. I think players like that are so crucial to teams. We talk about star players, but on every team there are role players and everyone needs to be depended on for certain things. And I loved the fact that in Phoenix I had a home there because I worked harder than anybody else and that isn’t an easy thing to do. My skill could only take me so far, but my work ethic and my drive took me further than my skill could. Suns.com: How closely have you followed the Mercury over the years? Obviously, you spent a couple summers as a color analyst on their broadcasts. Christensen: Yeah, before I moved out to New York I was back every summer and I broadcasted some of their games. But even when I wasn’t doing that, I was there as much as I could. You know, Diana (@DianaTaurasi) has been there forever, Penny (Taylor)’s been there forever. These are players that I played with. Suns.com: How did you like playing with Diana? Christensen: Diana is the best teammate I ever had and I think anyone that’s ever played with her would say the same exact thing. She is a great friend, a great teammate, and that’s very rare when you talk about someone with her ability. What I remember the most about her my first season was, “Shoot the ball!” She’s the most unselfish star out there. I think it was a hard lesson for her. I think she had to learn she needed to take those shots. She needed to be the one that, when you look at the stat sheet, when you see 20-25 shots up it’s not a bad thing. It’s your role. It’s what you have to do. It’s what people depended on you to do. I’m most impressed by the fact that she has embraced that aspect of what it is to be a star. Suns.com: Do you miss playing? Christensen: I do and I don’t. I miss that team environment, being around your friends. They do become your little family. But what it did to my body, I don’t miss. How I played and how many times I’ve gone to the floor and how I sacrificed my body, I’m still really paying for that today and I always will. So I don’t miss it in that aspect and I think being in the broadcasting world has kind of allowed me to still feel involved enough, where I don’t miss it horribly. Suns.com: When did you first start to think about broadcasting? Christensen: You know, I never really thought about it. I did a little bit of broadcasting when I was in Phoenix. I’d fill in for Tom Chambers here and there on the pre-game show, and I did some high school games with Kevin Ray. But it was just kind of something I thought was fun. I never considered doing it for a career. It was actually (@SunsTV producer/director) Bob Adlhoch (@badlhoch) who got me into it, kind of without me knowing it. The Sacramento Kings had an opening there about four or five years ago, and he mentioned my name to one of his counterparts at the Kings and said he thought I would be a good fit. I went through the interview process with like 200 other people, and went to LA and shot a demo, and all of this other stuff I had never really done before. When I got the job, it was such great timing, as it coincided with the end of my playing career, as I just couldn’t do it anymore physically. So I was very blessed to have it fall into my lap and once I started doing it, I could not believe how comfortable I was and how much I enjoyed it. Again I never envisioned this happening and just feel extremely fortunate I’m here. Suns.com: We thought you were going to give us credit for launching your broadcast career, as the co-host of our old web show, Nothin’ But Net. Ced (@CedCeballos) and I had some of the most ridiculous outtakes. I remember one right around this time of year, actually, when we kept laughing about a flocked Christmas tree. I had so much fun. Again, when you’re an athlete who’s been around athletes for so long, you have this camaraderie amongst each other. And I think that’s what it was, it was almost like being in the locker room or on a flight together, talking and having a good time. That’s kind of what I fell in love with in broadcasting when I started doing pregame, halftime and postgame shows. It is sitting with another athlete and a host talking about what’s going on, and kind of messing around with each other, letting your personality come out. That’s pretty much what we did on Nothin’ But Net. But I never took it as anything other than, “Oh this is a fun thing for me to do right now.” So it’s just kind of grown from there. 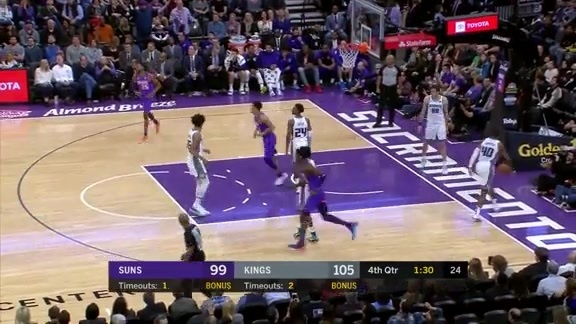 Suns.com:How did you enjoy your time with the Kings? Christensen: I was there three years. The first two years we did a live show and I worked with Fat Lever and we did the pre, half and postgame show, and I did some radio with them, as well. I was fortunate to work with some really talented people who were easy to work with and I grew as a broadcaster. I absolutely loved my time there. The last year they had budget cuts and they cut our pre, half and postgame show, and moved me over to their sideline position. That was something I had never done before. It was kind of stepping outside the box for me, but I was surprised at how comfortable I was doing it. In a pre, half and postgame show, you may have 30 minutes to talk about something, but on the sideline, you only have 30 to 45 seconds to get the point across and report something, but still be yourself and to me, that’s the most important thing. My time with ESPN has been the most difficult for me, because it’s broadcasting during the game, it’s the color analysis. It’s hard to describe what’s going on, but still feel like I’m being myself and not falling into this cookie-cutter-type persona. To me, as a broadcaster doing this, that’s the most important thing, for my personality to come through and I think it makes me different. That and the fact that I’ve played makes me different. 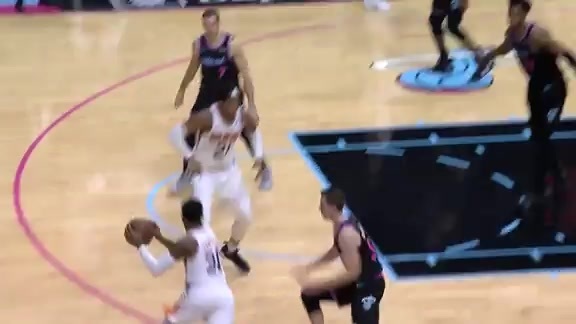 Suns.com: You mentioned being a big Suns fan. How familiar are you with this current team? Christensen: Steve (@SteveNash) had come to Phoenix when I was still playing for the Mercury, so I got to know him a little bit. He’s just the most personable professional athlete that you’re ever going to meet. You can sit down and have a beer with this guy, and feel like he’s one of the guys because an easy person to like. But you look all that he’s done and it’s amazing where he’s come from, coming out of college, to what he has become in the NBA. MVP, All-NBA, All-Star, all of these accolades that he has gotten. I absolutely love Steve Nash, but I also love the system that Phoenix runs. I think that is what’s so exciting, the brand of basketball that they play. I love what Alvin (@AlvinGentry) has done with them, but I’m also interested to see how they improve their defense this year, because they’ve brought in a defensive coach (Elston Turner). It’s very difficult to be able to play such a tough, long schedule that the NBA does and play that up-tempo style of offensive game, and still be able to really get into it on the defensive end. Although, I think Grant Hill (@RealGrantHill33) has been a perfect example of that. He works extremely hard at both ends of the court. He proves that you can do it. So it’s about personnel. It’s about getting the guys together, about buying into that system and really being able to make it work. So I’m excited to see how this defensive part of their game develops this year and, of course, watch them score a ton of points. Suns.com: What would you like to tell Suns fans about yourself and this new role? Christensen: I want to tell them, first of all, that I’m going to absolutely do my best with my tweets and Facebook messages. I want them to know I’m going to do my best to interact with them in the social media environment and to bring them into the broadcast on TV. I’m super thrilled to come back and I’m just as big of a Suns fan as they are, so hopefully I can do them some justice. Suns.com: Finally, how have you enjoyed living in New York, and how anxious are you get back to warm weather? Christensen: I moved to New York when my job ended with the Kings. Working for ESPN, you can live wherever you want and I just needed a change. But New York is a hard place to live. I have worked harder in the last year-plus, than my entire life. I’ve worked five jobs: substitute teaching, I worked in a restaurant, I bartended, I worked for a wedding planner, I’ve done a lot of stuff for the WNBA and the NBA both here and other countries. I represented the leagues in Africa and Venezuela, on top of doing the ESPN stuff. So I’ve worked really hard here and I love it, but I’m so excited to come back to the west. You know, it’s only 30 degrees here right now.